Every comic book reader knows that crossovers can be a slog to get through. For one or more issues, your favorite comic has to tie into whatever big Event is going on. With the original Civil War, these tie-ins ranged from good to completely and utterly terrible (including Civil War: Front Line which introduced us to the irredeemable Sally Floyd, who insisted Captain America was wrong because he didn’t know about MySpace and NASCAR). However, Civil War II’s tie-ins have been different. Which the main event has been okay (even if it keeps trying to use big deaths to shock readers), the tie-ins have ranged from good to outstanding. The good: Civil War II: X-Men has taken a look at how Magneto and his team of anti-heroic X-Men react to the news of a new Inhuman that could change the balance of power. Civil War II: Amazing Spider-Man takes a look at how Peter Parker reacts when Ulysses makes a prediction that one of his employees (an ex-supervillain) will break bad again. Civil War II: Kingpin is about, well, the Kingpin and how he avoids getting caught from Ulysses’ visions. Civil War II: Gods of War is about Hercules and his war with the Uprising Storm, having very little to do with, um, Civil War II. The great: Both Captain America: Sam Wilson and Power Man and Iron Fist have taken a look at how Ulysses’ visions are similar to profiling — with Luke Cage and Danny Rand going up against a group called “Preemptive Strike” that attacks former supervillains and Sam Wilson going up against the “Americops,” a private police force funded by a rich magnate and a senator, who have been accused of profiling and brutality. Both books have brought old characters back, with PM and IF using old supervillains and CM: SW bringing back the old New Warrior Rage (whose attitude completely fits this storyline) and U.S. Agent. Meanwhile, New Avengers is doing what Al Ewing does best: using crossover tie-ins as jumping off points to continuing his own storylines. In this case: “A.I.M. vs. S.H.I.E.L.D.” which is, in fact, turning out to be “A.I.M. vs. S.H.I.E.L.D. vs. W.H.I.S.P.E.R.” After one of Ulysses’ visions shows that Songbird is the mole in S.H.I.E.L.D. (she is Bobby daCosta’s triple agent), everyone goes into panic mode as A.I.M. tries to rescue her and W.H.I.S.P.E.R. attacks with the New Revengers. The outstanding: Would you believe me if I said it was Civil War II: Choosing Sides? Usually, Marvel releases these mini-series alongside their crossovers to take a side look at the Big Event from different characters’ perspectives. They had Civil War: Front Lines and Secret Invasion: Front Lines and Siege: Embedded. Usually, they are merely okay, but sometimes they are terrible (see: Sally Floyd). Civil War II: Choosing Sides has been amazing. Partly, that’s due to the one continuing storyline, a story about Nick Fury Jr written and drawn by Declan Shalvey (the artist behind Warren Ellis’s Moon Knight and Injection) which has been fun, but mainly it’s because the book takes a deep look at everyone’s reactions to the Big Events while keeping the focus squarely on the characters themselves, not on trying to be Big and Shocking. Take, for instance, the first story of Civil War II: Choosing Sides #2, “War Machine,” written by Jeremy Whitley (who previously wrote a delightful Misty Knight and Danny Rand story for Secret Wars: Secret Love called “Misty and Danny Forever”), with art by Marguerite Sauvage. 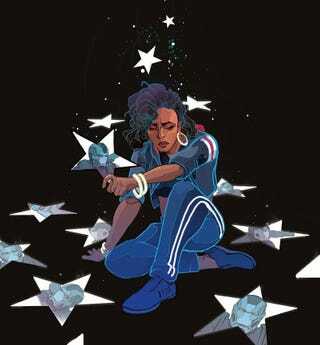 It’s about four characters (America Chavez, Monica Rambeau, Misty Knight, and Storm) and their reactions to War Machine’s funeral. The second story in this issue, “Goliath,” is also good, focusing on the nephew of Goliath, the black superhero who was killed in the original Civil War crossover, but this story was definitely the highlight. By focusing on the characters, it made the story have so much more weight and depth, depth that the main event needs. Jeremy Whitley is currently going to be the writer on the upcoming Marvel NOW book The Unstoppable Wasp and I can’t wait to see how good it is.